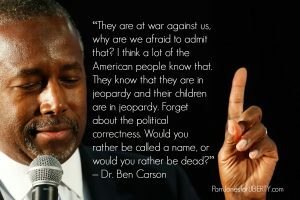 Ben Carson: Need to stop being so politically correct! TLB recommends you visit Pam Jones on her blog by Clicking Here. Every war is a bankers war. There is no government. Its a corporation. A president must follow orders from the federal reserve and central bankers. Its too late. The FEMA camps are ready and waiting. This will be the next housing boom for gated communities. I am sure wall street is betting on this already.